Last summer, I reviewed two of the first products in the mydlink family of smart home products: the DCH-S150 Wi-Fi Motion Sensor and the DSP-W215 Wi-Fi Smart Plug. 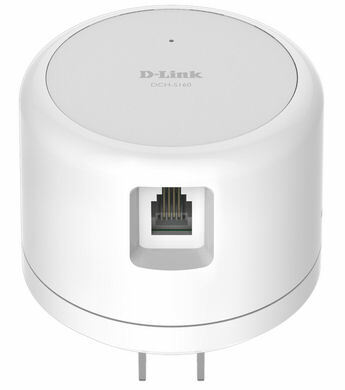 This week, D-Link announced the availability of two previously-announced new members of the mydlink family: the DCH-S160 Wi-Fi Water Sensor and companion DCH-S220 Wi-Fi Siren. This review will focus on the Wi-Fi Water Sensor. If you're a home or condo owner, you already know that water damage can be very expensive to repair. A leaking appliance, a stopped-up air conditioning condensation tube or a burst water heater can cause thousands of dollars of damage if you don't catch the leak quickly. The DCH-S160 Wi-Fi Water Sensor is designed to notify you immediately when it detects water. The DCH-S160 is a round device measuring 2.56 inches in diameter and 2.07 inches tall. The front and bottom image below shows that the water sensor uses a standard RJ-11 jack and a two prong electrical plug. The sensor ships with a 19 inch water sensor cable that detects water along its entire length. The product also ships with a 39 inch (1 Meter) RJ-11 extension cable to provide some mounting flexibility. On the side of the water sensor, there's a status LED, WPS (Wi-Fi Protected Setup) button and reset button shown in the callouts below. The mydlink Home app, which you can find in the Google Play Store or the Apple iTunes App Store by searching for "mydlink Home"
If you haven't set up a mydlink product, you're in for a treat. It's quite simple. The hardware is installed via the mydlink Home app on your iOS or Android device. Like the other mydlink products, the Water Sensor shipped with a small business card-sized Quick Install Card. The front of the card has instructions and a QR code to help you find the mydlink Home app. The rear of the card has a label that is unique to your device. To install the new device, you scan the QR code for your device from within the mydlink Home app and connect your device to your Wi-Fi network using the WPS pushbutton on your router and the WPS button on your water sensor. If you run into problems or your router doesn't support WPS, there are options within the setup program to configure the device manually. The entire setup takes just a couple of minutes. The setup gallery below shows screenshots for each step. Scan the QR code on the Quick Setup Card. You may have to grant the mydlink Home app permission to use your device's camera. D-Link has also posted a setup video on YouTube. The screenshot below shows the DCH-S160 landing page as displayed on my Samsung S5. The iPad (which is actually an iPhone app) version looks almost identical. Unlike the DCH-S150 Motion Sensor, there are no configuration options for the water sensor. Of course, that makes sense. There's no reason to schedule the water sensor and you want it to alert with maximum sensitivity. The Last detection tab opens up to display a log of water detection events. The Information tab shows the Product name, the Mydlink number, MAC address, IP address, Firmware version and provides an option to remove the device. Like the Motion Sensor, the Water Sensor can be used alone to provide in-app notifications, or can be used in conjunction with a control device such as the DSP-W215 Wi-Fi Smart Plug.